Stand on one foot and hop. Lisa proves that, unlike a kangaroo, she can touch her front paws together behind her back. These were among the instructions we received from a physician here in Wagga recently when we had our medicals for our Permanent Residency applications. It seems that PR status is only granted to people who can do things that kangaroos can’t. When we decided to look into PR status, we spoke to an immigration lawyer about our options. It seems that the rules are constantly changing; we know someone who got it before they moved here a few years ago, based on being a desirable professional (same field as Lisa). When we moved, all we could get was a 3 year, temporary visa; between the time of our applying and our arrival, however, it was changed again and anyone moving to regional (the Aus term for rural) Australia can get PR status without the usual two-year waiting period…so, if we had been two months later, we might have been able to do all of this from Canada. The nice thing is that with this new regional migration scheme, you have to be sponsored by your employer — and that means with the Uni, they also arrange a lawyer and pay all the fees (well, the government fee and the lawyer, we still have to pay for incidentals like medicals). They had to turn the film to get a proper picture of Dan's lungs. 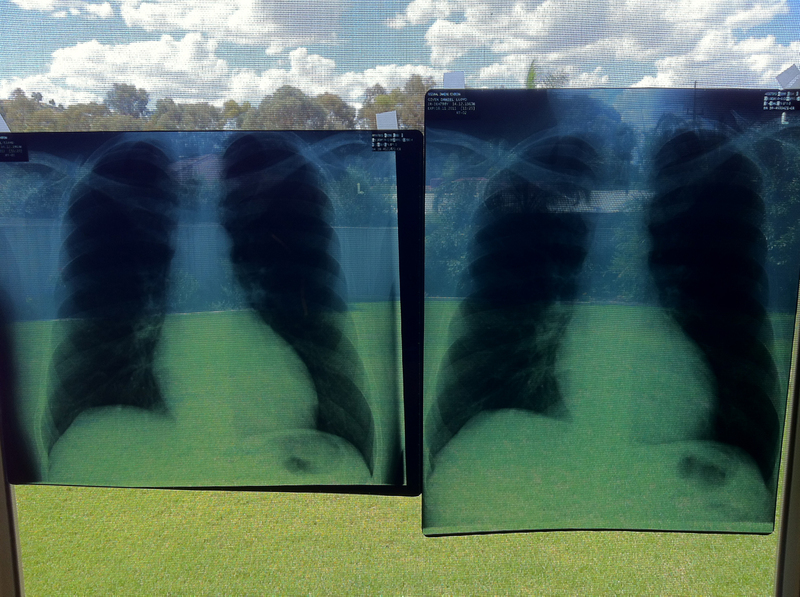 Those trees back there aren't actually in his lungs...they gave us the films, so they are hanging on the window as art. Chest x-rays: where we found out that Dan has long lungs…the first one they did didn’t actually get all of them so he was nuked again. Hopefully, the radiation from this doesn’t affect any of the later tests. General physical: eye exam, blood pressure, hopping (yes, seriously; first on one foot, then the other), squats. And touching your hands behind your back. You have to be nimble to live in Australia. Blood test: taken by a big tattooed bikie-type guy who really wanted Dan to cry when he poked him with the needle. He said women are better at having blood taken than men. He closed the door to the extraction room when Lisa was getting her vial taken, but left it open when Dan was in there so Lisa could watch him wince. Being Wagga, it was pretty quiet, so there were no other clients in the office at the time, so no privacy concerns. We also have to get a bunch of documents certified by a justice of the peace, which isn’t that hard here – it seems that CSU has a bunch of them on staff. We work with someone who is qualified, and he is happy to sign off on copies of our degrees, our birth certificates, our passports, etc., so they can be submitted with our application. A big pile of photocopying to be done. 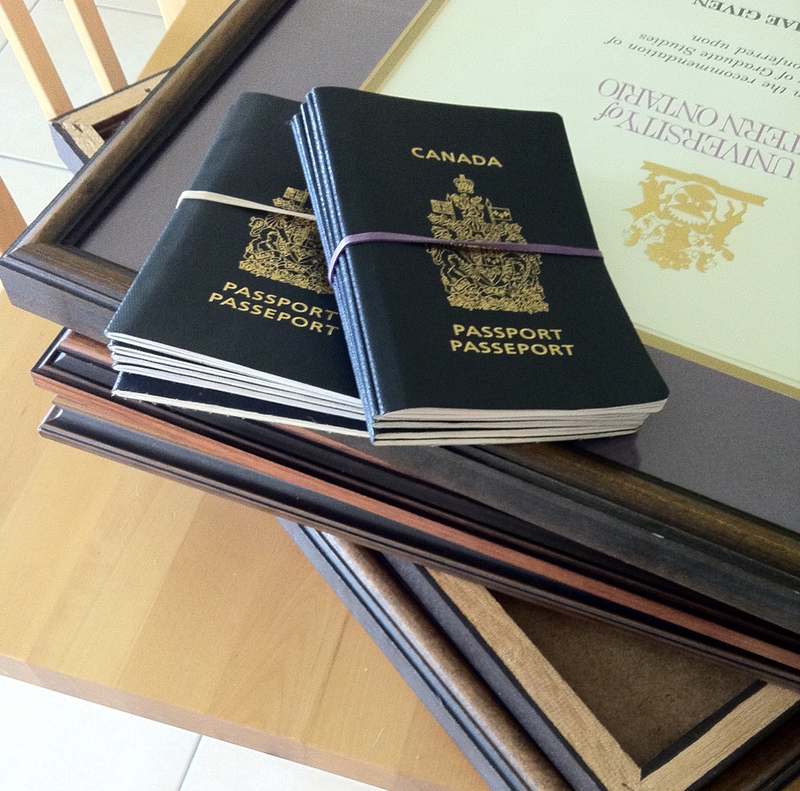 And here's a tip for anyone who thinks they might someday migrate: your old passports are more than just good souvenirs! We have no idea how we would do this application without them. Where did you go to school? When? What were your grad/convocation dates (right back to high school…and then Lisa’s 4 degrees!)? Where have you traveled in the past 10 years? When? And for how long? OK, that’s a tough one! For Dan, it wasn’t too hard going back 10 years (Aus a couple of times, UK a couple of times, Sweden, France, Germany, Chile, Argentina…); but for Lisa, Queen of the Airport…OMG!!! They actually want entry and exit dates of all international trips. Not hard for going in, because we were smart enough to keep all of our old passports, which have date stamps for each time she entered a country. But sometimes – many times – they didn’t stamp them on the way out. At Heathrow airport, coming out of the UK, for example, they don’t stamp it. So we had to think hard about how long we were away; and did we come back on the same day? Usually, but not always. And many of the US trips she made in the last 10 years also don’t have a detailed record of when she came home, so there was a lot of looking back at her CV, figuring out why she was there (conference or meeting) and how long she would have stayed. Ughhhhhhh! But, in the end, we think we have it as accurate as possible. And that’s not all. Yes, these parts have been tough, but wait for the next post about the most horrible part of the process, yet! This entry was posted in Australia, Canada, identification, medical tests, passports, Visa. Bookmark the permalink. 1 Response to Stand on one foot and hop. I feel your pain! I just finished off my PR package for Canada (immigrating the economic route rather than marriage because it’s actually faster), and it was 20 pages worth of personal history and another 30 pages of documents (my MLIS, transcripts, letter from SLIS, letter from U of A, passport copies, work and study permit copies, copies of t-4s and notice of assessments, a current phone bill…the list goes on). And on top of that, I’m paying $3700 for the application and my lawyer fees. I don’t even know if we’ll be here permanently, either! Well, at least I’ll have legal status in the country, right?